posAbilities offers a menu of services that grow and change in response to needs and wishes of our persons served and the families who care for them. We specialize in assisting people with life’s transitions – to and through adulthood. Laurel Behaviour Support Services [LBSS] provides Early Intensive Behaviour Intervention (EIBI), behaviour consultation to school-aged children and youth, and adult services to individuals who have an autism spectrum disorder and/or intellectual disability. Our consultants use the science of applied behaviour analysis to address challenging behaviours and to teach adaptive skills that will produce enduring changes in their quality of life. Together with families, we strive to increase a person’s independence across a variety of settings – home, school and community. We offer a variety of meaningful and enriching programs in Vancouver, Burnaby, Richmond and Maple Ridge. Persons served may choose to participate in one or more programs of interest and are encouraged to explore community based initiatives. Alternative Creations Studio and the Stage Door Theatre Troupe for example, are two programs that specialize in the visual and performing arts. Artists participate in local events like the East Side Culture Crawl, Annual INCLUSION Art Show and the Can you dig it! community gardening initiative. The Stage Door players create live theatre productions, produce video shorts, and participate in film festivals. You will see some of their recent works on YouTube. posAbilities Employment Service assists job seekers to prepare for, secure and maintain competitive, community based employment in both the Tri-Cites and Vancouver areas. New to Employment Service is a fee for service being offered throughout Metro Vancouver to assist persons with developmental disabilities to find competitive employment in their community. 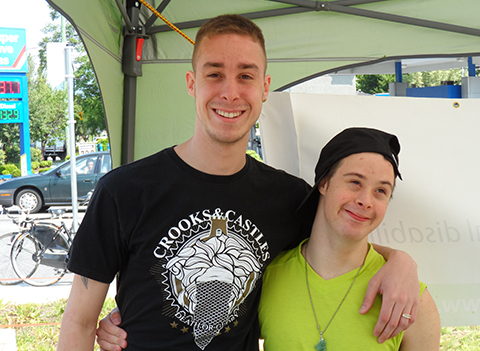 posAbilities offers a variety of home living supports throughout Metro Vancouver. We assist people to continue to live independently in their own homes, in semi-independent or 24 hour care staffed residential homes, or other shared living arrangements in their community.